The leaves shined with their usual early morning slick reflecting the light from a nearby cluster of dying stars. This oily layer would simply roll off and land on the ground to be raked up by his mother in the morning as solid globules of clear jelly like substance. A perfect and wonderful accompaniment to breakfast. The smells from his mothers cooking quickly and rigorously penetrated through the air and attacked Dante’s senses. Stirring a yearning within himself he had to stifle the urge to attack the food being prepared. He remained on the small cement stair leading into a crippling old barn. A bad infestation of snorquiels rocked the entire building forcing it to have a twisted appearance from the road. Not entirely vile creatures these little guys flew headlong into objects before taking a large bite. They ate anything. They also couldn’t see, so when one got into the barn it couldn’t figure out how to get out. It just continued to fly in circles eating. The constant thud eventually drew more believing there was a feeding frenzy. Eventually ten snorquiels took a toll on the barn. Now Dante sat in front of it on a small cement step. Small green entities grew beside the step and whispered their airy songs to each other in the morning’s light. Two of Dante’s friends sat beside him contemplating their plans for the evening. Marsha and Egna were excited to be there. Dante was quite the odd man. He was one of very few who never made the trek into the Norchanelin Forrest. It wouldn’t seem like a big thing to anyone from another planet, but this forest granted wisdom to the seeker, yet fear to those who feared. Lime green tonda, much like that of water to us here, to those who sought, or poison to the disbeliever. The forest called to you when it was your time, yet the forest never called Dante. This was a phenomena that was not witnessed often. It was a thrill to be with Dante as he was a one not called. The three sat there, on the cement slab, outside of the crooked barn, snorquiels long gone, when fireworks began over the roof. It was only morning, yet the sky seemed to be darkened. Brilliant flashes of green and red illuminated what was now a dark sky. Deafening cracks of the fireworks echoed between the buildings. Though fireworks were often something of celebration, there was a certain oddity to these. They stared into the sky in amazement. Within a moment the fireworks ceased but only as an old fashioned earthly helicopter flew into the scene. It’s spotlight shined on many objects, following this one there was another. The second helicopter had a light as well, but it was directed at the other helicopter. Directly behind that there were others, in fact many. Each had a light affixed to the bottom that was shining directly at another. It was as if there were an airshow today. They flew by quickly, some hovered, others coming within a few feet of the three sitting on the cement slab. The second helicopter soon turned off its light, which the first faded with it. Each helicopter was projecting the next helicopter. They were all holographs. Projections in the sky that held their own intelligence and physical capabilities. It was a scene much unlike any had seen before. It seemed so real. The sky as a whole soon switched to a fake sky but there was a tall tower, and a large crane with a claw. The picture moved with the claw as it picked up a small box. Red, this box. With a poor lady within, dressed in white, while her brown hair hung low to cover her eyes and shield them from what she may see. A projected and extremely loud female voice soon resonated through their minds as if an internal speaker had begun. “Ladies and Gentlemen, announcing Code shift twenty one OC.” The claw carries the lady in the red box to the top of the tower. Placing her there, small clasps from the tower secure her position. Still without seeing her eyes the picture zooms on her. “We have your best interests covered.” The voice boomed happily. With that the sky went back to normal. Dante’s mother was looking skyward, amazed. Dante, Marsha, and Egna made eye contact. Eyes wide they couldn’t believe what they saw, but they knew it wasn’t good. An unsettled feeling quickly gripped them. “Get in the HOUSE!” Dante’s mother screamed. She was shrieking with terror as she ran towards them, flailing her hands. Screams could be heard. Hoards of screams. A thousand banshee’s were making their way across the land. The three stood and ran toward his mother. “Get in NOW!” She screamed at them, and grabbed the closest thing that might work as a weapon. “It’s begun!” She shivered in her own words. Fear had gripped the land. Within every moment of our lives there are decisions that need to be made. Forks in the road in which you, the traveler, must decide which path to take. Small moments such as your morning coffee: homemade or Dunkin Donuts? To greater moments: college or vocation? Either way it is these moments that define us. They shape us. They create a unique story and perspective into who we are. It was in one of these simple opportunities when I had decided to move to San Diego. I had been afforded the wonderful opportunity to be in a relationship with a great guy for four years. In these four years I had found my strong ability to settle down. To change small habits of my own to fit what made him comfortable. To understand how best to address or go about handling situations with him. And to build a small tolerance to being alone all though he was off and out with his friends. Ultimately it was in this that I recognized my ability to establish longevity and common grounds. It was also in this where I had lost major parts of myself. The man everyone loved, the one that he had ultimately fallen in love with. During this lovely relationship, I had been introduced to my friend Austin Stannius. (You have read about him before) Being as he’s in the Marines and stationed in San Diego, conversation often turned from our books to the fun that he was having out there. Weather, stories, and experiences had sounded like an amazing endeavor. I began to check out what was really going on out there. I fell in love with the pictures and the weather reports. I learned they had a football team, the Chargers, Coronado Island was a huge tourist attraction, and La Jolla hosted some of the finest restaurants in all San Diego. My interest was aroused. I had always wanted to go to the west coast but I had never truly looked into what it would be like. On October 1st 2011, the lovely relationship aforementioned, came to the end it was destined for. Holding my head high as best I could I continued to work, read, smoke, and drink as usual. I began hanging out with friends to prevent myself from slumping into the looming depression. The nights I was forced to spend alone would be spent in solemn numbness. An occasional tear, or thousand, but I kept my thoughts from drifting. They would only feed the monster in the corner with the red eyes. Made of wisps of imaginary darkness heavy enough to drag one down, hold him there, and torture him there. A fight that would only end in surrender before the beast would hurl one into it’s dark cave, cold and lonely. I had to pretend it wasn’t there. It called to me everywhere and yet I had to keep on. Before long, I was on a roll. Social life blossomed again, new friends and situations. People genuinely interested in me. Interesting people of which I couldn’t learn enough about. Friends who lent an ear, gave advice, offered living space, made me smile, danced the night away, enjoyed each others company so much there was no need for any television, and all around great people. There was a hitch. The decision had already been made. It was several weeks in the planning, but it was now time for me to move on. I had convinced myself of that. When I was a young boy, I always watched Emeril Lagasse cook. When I was old enough to get into a serving position, I wanted to work as a fine dining restaurant manager for Emeril Lagasse. A beautiful life goal right? I accomplished this. I loved it. But I then began to ask myself, What else? I don’t feel like that is the top of the ladder for me, but it was the top of that ladder in my life. What else can you do there? Stay – and be on top of that goal ladder and know you made it or, Jump! 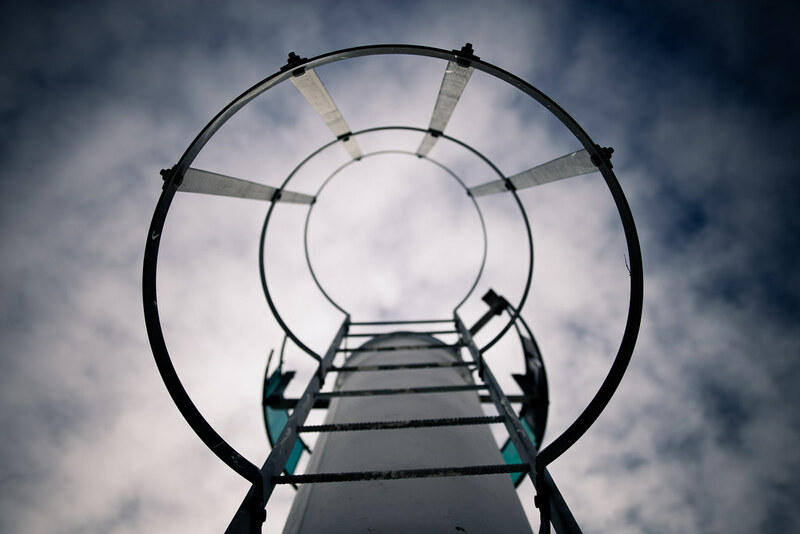 Jump to the next ladder that extends past this current ladder, gets you higher in the proverbial ladder maze of life. Scary as the leap is it will prove worth it. Even if this one extends only fifteen feet above the last, I’m still further. It is with this thinking that I chose to pick up and move everything to San Diego. Press the Re-set button. Bring my life lessons, experiences, and goals with me for a trip to the next big thing. Feb. 20th I begin my trip. I intend to stop at Myrtle Beach, Memphis T.N., the Grand Canyon, Hoover Dam, and Vegas. I will be taking pictures and posting as much as I can here from thoughts to fears, woes to victories, and scary to funny. See you soon, and thank you for taking time to read this blog!